THE BOOK OF EVA has two romance subplots. One is of the forbidden nature kind. There are a few love scenes and the heat level is on the mild-moderate side. One of the romances ends on a note of hope, although there are still obstacles facing the couple. Still, I strongly recommend approaching the story as romantic SF. It includes some romance genre conventions and thus has cross-over appeal, but is very much a hybrid tale. 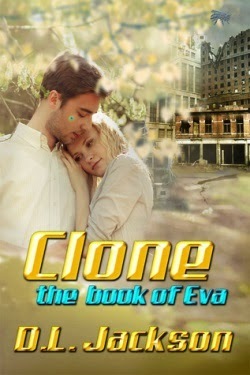 THE BOOK OF EVA is social science fiction with some futuristic tech. The plot is character-driven with political threads woven throughout. There are only a few action scenes. I agree with the author about its cerebral feel. The characters are interesting and I cared about what happened to them, but the story's main focus is on certain ideas and themes. This story features heroines with agency. They make decisions that drive the plot, take risks, face dangerous situations, and endure many sacrifices. So if you hear of someone looking for SF stories with empowering female protagonists, point them toward THE BOOK OF EVA. A main SF trope in the story is clones and how they’re treated, which are as sub-humans and slaves. Some of the scenes are disturbing and unsettling, as they should be given the concepts explored. As the blurb hints at, a rebellion is brewing and a clone is involved. I did end THE BOOK OF EVA with some questions. Given that this wasn’t an epic length book, a bit more backstory about the setting and a few other elements would have been welcome. I also wish there’d been more racial diversity. For a futuristic Earth, the world felt very "white." It would have been interesting for a story like this to explore the issue of clones of color—would they have suffered more severe racism than their white counterparts? Were POC even cloned in the first place once the technology became available? To sum up, here are my tags in a nutshell: dystopian SF, post-apocalyptic setting, clones, experimental, political, romantic SF, non-linear format, strong female protagonists, social science fiction, mild-moderate heat level, rebellion. I’m glad I read THE BOOK OF EVA and I admire D.L. Jackson for taking an experimental approach. Perhaps she'll write more sci-fi romance for us with this level of intensity? :) At the very least, I hope this book gains more readers.